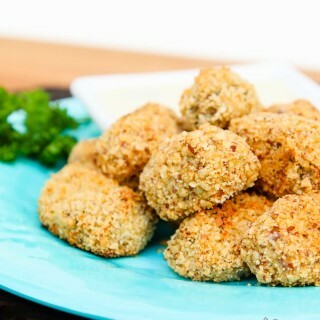 These cauliflower bites are the perfect finger food and snack to get those extra veggies in! Add your favorite chips to a food processor . Pulse a few times until the chips are finely crumbled. Be sure not to get it too fine to a grain-like consistency. The crumbs should still be identify-able, but fine enough to coat the bites. Process enough chips so that you end up with 1 1/4 cup crumbled chips. Set aside in a bowl, and wipe the food processor clean with a wet napkin. Wash the cauliflower, dry completely, and cut into large pieces. In two separate batches, using a food processor , quickly pulse the large pieces of cauliflower 8-9 times until uniformly chopped into rice-size pieces. Be sure not to get it too fine. If there are a few larger pieces still in the mix, chop them down by hand or remove them. Empty the contents into a paper towel lined bowl. Try to use the paper towels to absorb and get rid of as much water released as you can from the cauliflower "rice". Set aside. Note that you should end up with about 4 cups of cauliflower "rice", as this is the amount that the recipe uses. In a small bowl, combine the ground flaxseeds and water and set aside for 5-10 minutes. Heat olive oil on medium heat in a large non-stick pan . Add the minced garlic and fry for 30sec-1min until fragrant. Add 4 cups of prepared cauliflower "rice", mix, and cook covered on low-medium heat for only 5 minutes until the cauliflower "rice" becomes slightly tender. Remove the cover, and cook uncovered on medium heat for about 1-2 minutes, stirring frequent to cook-off most of the excess liquid released from the cauliflower. Note that if there is too much water remaining, the mixture will be difficult to work with. Pour the flaxseed-water mixture into the food processor, along with the parsley, and cooked cauliflower "rice". Process by pulsing in a food processor until everything is finely chopped and combined into almost a paste, then transfer the mixture into a large bowl. Place the bowl of the cauliflower mixture in the fridge for about 10 minutes or until the mixture is cooled. Remove from the fridge, add 1/4 cup of the prepared chip crumbles, season with salt and freshly ground black pepper to taste, and combine. This mixture should be form-able (hold together when squeezed) and still a little wet so that the chips will stick to the bites. Line a baking sheet with parchment paper. Scoop out about a tablespoon of the cauliflower mixture, roll it into a ball, and shape it into a small cylinder (like tots). Carefully place in the bowl containing the crumbled chips and roll them to evenly coat the entire bite. Place on the lined baking sheet. Repeat with the rest of the mixture until they are all lined up on the baking sheet. Lightly spray with cooking olive oil (optional), and place in the oven. Bake for about 20-30 minutes until they are crispy, firm, and will hold together. While they are baking, prepare the Vegan Cucumber Ranch Dressing , and place in the fridge to cool until needed. Once done, remove from the oven and allow them to cool slightly until they hold shape. Dip in the prepared creamy Vegan Cucumber Ranch Dressing and enjoy! Tortilla Chips - Use some flavored/salted chips for this recipe such as Way Better Snacks Sweet Potato, Sriracha, or So Sweet Chili flavors. This recipe will also work using salted planko breadcrumbs instead of the crumbled chips if you prefer. Gluten-free - Use gluten-free planko breadcrumbs. Note that the recipe is developed for 4 cups of prepared cauliflower "rice". Please adjust the amount of ingredients as needed. You can place the leftovers in the fridge and simply re-heat in the oven (or toaster oven) by baking them at 375 degrees. The bites may loose some of it's crispiness, but they will still taste great.